West Coast scientists are studying California mussels and how they might adapt to ocean acidification. This week, scientists from around the world are meeting in Monterey to discuss what they call the “other” climate change problem: the oceans are becoming more acidic. It happens as oceans absorb the carbon dioxide we add to the air through burning fossil fuels. Scientists say it can be bad news for ocean animals with shells like oysters, mussels and others that are key to the marine food web. How bad? Some scientists are hoping that ocean conditions off the California coast will help them find out. You don’t have to go far to see the impacts that acidification is already having. At Hog Island Oyster Company, just outside Point Reyes, co-owner Terry Sawyer is seeing the effects in his supply chain. The oysters grow up in big, mesh bags that sit out in Tomales Bay, but Sawyer gets the oysters when they’re small, “the size of your little fingernail,” he says. He orders them from hatcheries in Oregon and Washington. A few years ago, Sawyer started getting calls from those suppliers. They couldn’t fill his orders. “They would have tens of thousands of gallons of tanks that were absolutely full of larvae. They would have the entire system die or crash,” says Sawyer. A pile of oysters being sorted at Hog Island Oyster Farm. The hatcheries were filling their tanks with seawater that was becoming more acidic. Scientists say the oceans are 30 percent more acidic since the start of the Industrial Revolution. 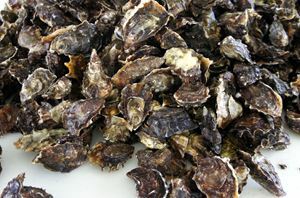 The more acidic the water, the harder it is for animals like oysters to build their shells. Their shells are weaker and they grow more slowly. Sawyer is raising his own oyster larvae now so he’ll have a more predictable supply. But he says there’s no question that climate change is affecting his bottom line. “We don’t know if we’re going to be able to survive the very real trending that is going on out there,” he says. It’s a trend that could affect the entire food web. “You can see here, this is a mussel bed that’s made up of lots of California mussels,” says Eric Sanford, an ecologist with UC Davis’s Bodega Marine Lab. The rocky point we’re standing on is covered in tightly packed, purplish mussels – what he calls the “foundation species” of the California coast. “One that really defines the whole ecosystem, sort of the way corals define a coral reef,” he says. 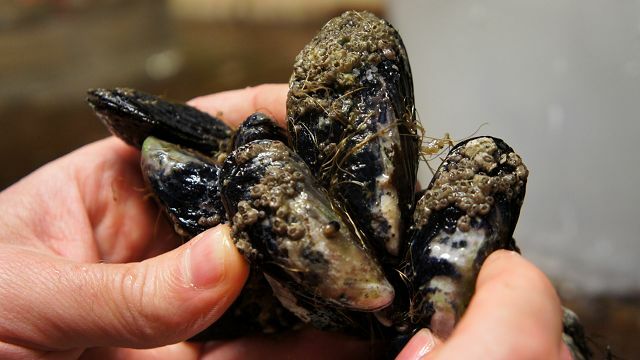 Mussels are a key part of the food web and so are a lot of animals with shells, says oceanographer Tessa Hill. “Probably most people like the fact that we have things like whales and salmon off along our coast. Those organisms are likely to be impacted because their food source will be impacted,” Hill says. The big question is: will animals with shells be able to adapt to a more acidic future – where, in a hundred years, the oceans could be more than twice as acidic? 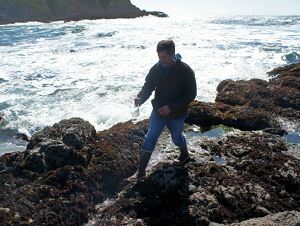 Eric Sanford at a mussel bed near Bodega Marine Lab. These California mussels could help answer that. “They’re facing the most acidic water that you’d see in the open ocean today,” says Hill. As Hill explains, acidic water from the deep ocean rises to the surface on the West Coast in the spring and summer, when the wind is blowing. This upwelling makes the waters off California some of the most acidic in the world. As part of OMEGAS, a new project linking universities up and down the West Coast, researchers are asking: if organisms here have been blasted with more acidic water for generations, have they adapted to handle it? Inside their lab, Hill and Sanford show me jars full of young mussels, almost too small to see. Each jar is from a different part of the West Coast from Oregon to Santa Barbara. They’re being grown in water that reflects conditions in 2100, says Eric Sanford. “The issue we’re looking at is whether there might be genetic differences among different populations along the coast in their ability to cope with ocean acidification,” he says. “We found they have lucky genes,” says Steve Palumbi, biology professor at Stanford University who is also working on the OMEGAS project. He studied populations of another shelled animal on the West Coast – sea urchins. There have been lots of plumbing problems on the West Coast, so to speak, in the form of acidic water. “And so all these populations, urchins anyway, have had to get the toolset to deal with it,” says Palumbi. In a paper still in review, Palumbi says they found a segment of the urchin population that had around 100 genes that make them better adapted to more acidic water. That makes them more likely to survive and reproduce. (Check out this microdoc video for more on their research). Organisms will evolve, he says, but probably not fast enough to keep up. In the meantime, Palumbi and other scientists are mapping where the genetically resilient mussels and urchins are on the West Coast, so policymakers can look at protecting them. Seawater is about pH 7.5 to 8.5, right? So it’s weakly basic. So what is “more acidic” in that context? Funny, there are no numbers here, just breathless hyperbole. I doubt there is enough pH variation outside the norm to justify calling even transient spots of lower pH “acidic”. And the deep upwelling source waters last saw the surface when? Decades, even over a century ago? So how does that relate to today’s atmospheric CO2? And in coastal waters there are all sorts of sources of acid beside atmospheric CO2. Tannin, and carbolic and carbonic acid from decaying algae and vegetation in marshes, sulfuric from volcanoes and sea floor vents, nitric and nitrous from fertilizer runoff. If you had sound science to rely on, you wouldn’t need the scare words. You’d think. Remember “acid rain”? The deal is the ocean carbon cycle, sea life can’t form shells in larvae below pH 7.9 reliably, by 7.7 they go extinct, the move toward more acidic matters well before the water is acid. Ask anyone with a saltwater aquarium how important pH is to keeping things alive. So, here we are with air 405-ppm CO2 and the water right now about 295-ppm CO2 of the coast, so, that’s why it’s acidifying so fast. So fast to be faster than any mass-extinction of the geologic past, that’s the point, well proven imposing fact easy to measure against the past. Choice is to either shut down Mr. Fossil from the Steam Age or watch it all die and that can be quickly, a single lifetime, simple as that.